Providing Sports Injury Rehabilitation and Sports Massage. Based in West Wickham, Beckenham and Bromley. promote the healing of the injury, improve range of movement and recorrect any imbalances. Hoss was the lead Sports Therapist at Bromley RFC for 7 seasons. He currently occasionally works for England Rugby u18s and Kent Rugby Junior section. 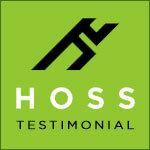 Welcome to the website of Hoss Sports therapy. Hoss was recommended to me by a friend regarding an on-going sports injury I had. What I have been most impressed with is his polite, professional manor and his attention to detail. Where Hoss differs from other sports injury therapist’s I have seen is the exemplary aftercare using the Track Active app which provides on-going support.